Looking for the best plagiarism checker tool for bloggers? Here are top 8 best free plagiarism checker tools 2019, enjoy free plagiarism detection. As you are reading this article, we can assume that you are interested in knowing what are the most popular and best free plagiarism checker or online plagiarism detection tools to check for the plagiarism in seconds. Well, Plagiarism is the ever time enemy of every blogger. It badly affects both our reputation and search engine rankings as well. When a person sees the copied content first, he may think that it is we who copy-pasted the article. And, search engines do not like duplicate content. So either the original or the copied article does not get good rankings. If that misfortune happens to the original content, it will be a disappointing situation. So, you should be extra vigilant about this dreadful situation. That’s why we are here with this detailed guide on best free plagiarism checker tools 2019. All of us know very clearly, Google does not like plagiarism materials and it is a fact that plagiarism is the biggest issue nowadays. So, if you don’t want to be the part of plagiarism then using a powerful plagiarism checker is an essential way of protecting your written work. So, we have handpicked seven best plagiarism detection tools to help find copycats. All these best free plagiarism checker tools come with a unique checking algorithm and offer various helpful service too. You can even use any search engine for this purpose. Small SEO Tools are a bunch of online tools for increasing the SEO of your blog or website. They have been providing the best plagiarism checker for a while now. But the fact is you can’t check the content with more than 1000 words. What it does is scanning the whole web and highlights your text in red when a matching phrase is found. The red texts are links that lead to the original source. If you want to check articles with more words, it is recommended to split the same and check. Duplichecker is another free online plagiarism checker. You will be provided with a text area, which can contain 1000 words. As an added benefit, this free plagiarism checker allows you to insert DOC or TXT file also. So, you don’t have to copy content from MS Word only for plagiarism checking purpose. You will be displayed matching content like in a Google search by clicking the Search button. From there, you can compare both the items. Plagium provides you two options, Quick and Deep search. You need to sign up for using the latter. This free plagiarism detector displays result quite similar to Duplichecker. Here, you are limited to insert 5000 characters only (not words). You can filter the search by restricting the checker to search the entire web, news or social networks only. The advanced options feature lets you customize the appearance of the result. You don’t have to wait for a long time as this is pretty quick. If you are serious to get one of the best plagiarism detection tools, there is nothing wrong in signing up to Plagium. Plagiarisma is not a mere free plagiarism checker only. There are a bunch of useful tools available like article rewriter and spell checker. You can check for plagiarism by three means, either by pasting content directly or inserting content URL or by uploading the file. You have to sign up to this for making use of the complete features. Or else, you can’t even check on Google. Plagiarisma.Net: Free Online Plagiarism Checker for Students, Teachers, Scholars, Educators, Scientists, Essayists, Writers. I have used it and found worthy. You will be provided the source if it finds any plagiarism issues. A premium version is also available that makes more sense than free. But still, I can surely say that Plagiarisma is one of the best free plagiarism checkers online. Here comes another one, Plag Tracker. Free and premium account options are available. If you are serious about your content, just skip the free plagiarism checker and go for the premium. You can only paste the content and check for plagiarism. Plagiarism checking tool – the most accurate and absolutely FREE! With Plag Tracker, it is not allowed to check a URL or word file. Addition to this, an API is provided to give you access to advanced checking on elsewhere. You can check articles with any number of words. Plagiarism Checker is not one you can rely upon if you are looking for an all in one free plagiarism detection tool. You can only copy-paste the content and then check for issues. What it does is simple. You can even do it yourself without the help of a tool. Plagiarism checker checks your content on Google or Yahoo. It will give results similar to those we get in a Google search. If you don’t want a free plagiarism checker tool, you can directly search a phrase from your article. It will surely give you better yields. I like the minimal interface of this tool. Most of the free plagiarism checking tools have many advertisements. So often we get confused to find the Search button. But in Dustball Plagiarism checker, you can’t find any ad except a user- friendly text that encourages going for the premium version. 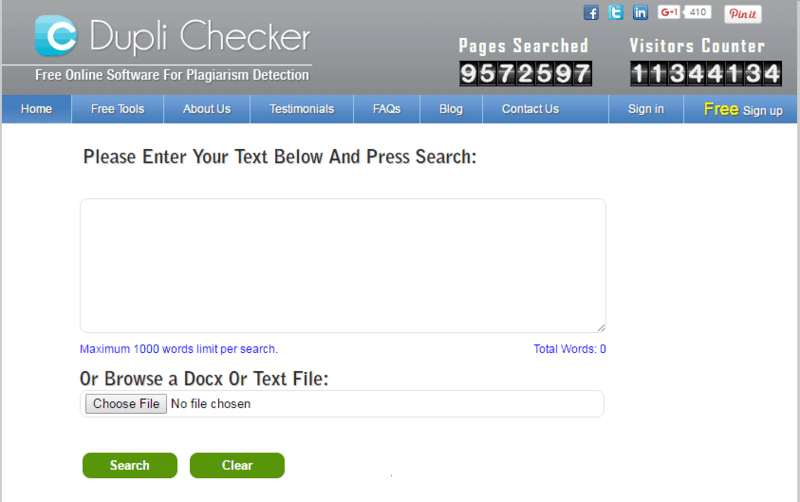 The Plagiarism Checker: Free plagiarism detector to get more accurate plagiarism detection. I haven’t seen a limitation both regarding word count and character count. You can also upload a word file and check for plagiarism. According to me, this is one of the best plagiarism checkers for free. Plagiarism Detector is another helpful option for you if you are looking free online plagiarism checker to check plagiarism. This duplicate content analysis tool comes with a very simple user interface and clean design. It offers both options: Enter text to check plagiarism or Attach the file of content to detect duplicate content. You will feel impressed after seeing its fast plagiarism checking speed. Plagiarism Detector | Free Online Plagiarism Checker to check Plagiarism. In simple words, Plagiarism Detector is really one of the best plagiarism software to detect duplicate content and it is highly recommended for Students, Teachers, Scholars, Educators, Scientists, Essayists, and Writers. If you know all the important reasons to use plagiarism checkers then overall all these free plagiarism checker tools are the most appropriate solutions to check for plagiarism. So if you were looking for a free, automatic and efficient duplicate content analysis tool then you can easily select any one from the above-explained free plagiarism detection programs. Simply, copy and paste your content into the box provided by each free online plagiarism checker tools and get your analyzed content result. Please feel free to share your view with us through the comments – which best free plagiarism checker tools you are using right now for plagiarism detection? Honestly, it’s not a high-quality tool (their report is pretty unclear) but at least it’s free. You are right for most of them, but i think the paid ones you have talked about should not be included. Another list for them can be should be complied. You should also compile a list which should contain best plagiarism checkers. These plagiarism checker tools are really important to maintain the quality of content. I use plagiarism checker. for a 10-day free trial to experience their services. Articles and interviews with key figures in cyber security make for interesting reading, but the most important part of the site is information on certifications. Hi Amit, is there any other way or tool you can recommend me for check plagiarised content in PDF files? Really helpful for bloggers. Palagrsim check is necessary for every content because copy content kills the SEO rating and result in poor readers experience on any blog. Small SEO tools are very well accurate plagiarism checking. Thanks for this huge list ? Really there are some tool which I was not knowing. I mainly use Copyscape and Tynt. In this list you are missing one important online grammar and plagiarism checker tool called Mygrammarcheck.com Please have look and add few more lines about it so your website visitor gets best.